Promo stunt goes horribly right! 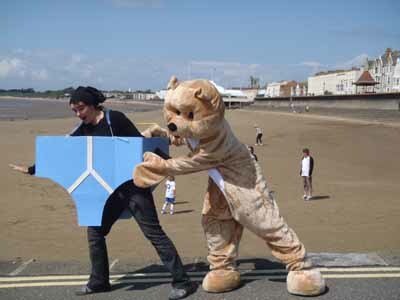 There was an unlikely occurrence this weekend, as the home-made promo team for ‘That Bear Ate My Pants!’ swung into action at last. Well, you’ve seen the picture. What more do I need to say? If I was known for having rational ideas, well, it probably wouldn’t have been worth writing a book about my life. If things had gone according to plan, this little stunt would have taken place on Launch Day Weekend, on Friday and Saturday last week. A family crisis meant we had to delay it ‘till this Fri/Sat, and the fact that is pissed it down with rain most of Friday persuaded us to reschedule for Sat/Sun. 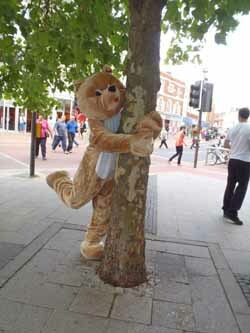 No-one wants to hug a soggy bear. No-one wants to wear one. There was a major disadvantage in these delays; it meant that I was available. On Launch Day I’d hardly dare leave my computer to pee, and my wonderful sister (Gill) and fiancé (Roo) had planned to do the bear-and-pants-show without me. Now, a week later, I had no excuse at all. And neither did my Mum, so I roped her in too. At a gnomic five-foot nothing and a quarter, she looked less like a bear and more like an Ewok. We’d been up all night printing flyers and reinforcing the gigantic pair of cardboard underpants. So, a fairly typical evening in my house. On a beautifully clear Somerset morning, we descended on the town of Taunton. My first victim was an older woman, slender with long grey hair. Unlikely to buy my book, I thought, but an ideal test subject; my sales pitch had yet to be practised. Hell, it had yet to be invented. I approached her and muttered something about having written an e-book. She turned on me, eyes blazing with righteous fury. “I don’t approve of THAT at all!” She declared. She then proceeded to tell me in emphatic detail, how technology was the work of the devil. How our society is being destroyed by it, even as we speak! How we are sinking further and faster – the only way to free ourselves is to wipe it all out forever! There really wasn’t much to say to that. I hadn’t been cursed so thoroughly since… well, ever. “Would you like a flyer?” I offered. She glared at me as though I had stood on one of her doubtless many cats, and I retreated slowly. The rest of the morning passed without incident. Not without interest though. Once the crazy woman made her departure, I offered a rather more subdued sales pitch to the green-grocer she’d so kindly paid with pure, innocent cash. He was more receptive. “Sounds great,” he enthused, and whipped out an iPad from under his stall. He concentrated for a few moments, tapping the evil device on various corners with a grubby finger. I was stunned. For a techno-whoring minion of the antichrist, he was a jolly nice chap. There was a bloke collecting for Guide Dogs for the Blind, sitting outside the car park on a stool with his bright blue plastic bucket. We’d all donated after parking, and had threatened to come back in costume. Now seemed like the perfect time for it. Gill handed him a flyer and he glanced down in surprise. “We’re advertising my new book, all about my crazy adventures in Ecuador!” I explained. He was still clutching the flyer the next time we walked past. Roo was a great advocate, loudly proclaiming the merits of the book to everyone we passed. “Buy it – it’s hilarious!” she told a businessman. After that she decided to take a turn in the bear. We de-beared and de-pants’ed outside Debenhams so we could swap jobs and take it in turns to use the loo. Roo suited up and immediately started dancing to the music in her head. Within minutes she had been offered a job by the cafe next-door. They needed a human statue for the upcoming flower festival. Apart from us getting married that week (and going to my Uncle’s funeral in Manchester) we really didn’t have much else on. So she took the job. We moved to the seaside for the afternoon and the lifeguards were fascinated. When the Giant Underpants shoved their way into their hut there were gales of laughter on all sides. “Hot pants,” one of them quipped, eyeing up my sister. “People have been trying to get into her pants all day,” I warned. I groaned all the way down the beach. I favoured her with a grin and launched into my standard spiel. “I’m telling everyone about my new book, ‘That Bear Ate My Pants!’ It’s very funny, and there are bears in it doing very funny things!” Okay, so it wasn’t exactly my standard spiel. I handed her a flyer to seal the deal and strolled off. “Here you go,” I told her, handing her another flyer. She skipped away merrily. “We’d better move,” I said to my team. “Eh? Why?” They followed me quickly back up the boat ramp and into the crowd at top speed. “Where are we going?” Gill asked when she caught up with me. Of the teenagers we met, some were clearly too cool for skool. These types, terrified of anything that could endanger their street cred, fixed their ludicrously outsized sunglasses on the horizon and strode past as quickly as possible. But one group of lads showed an interest. They dared each other to hug the bear (something that kids as young as 18 months had been managing to do without being dared all day). “Is it a boy or a girl in there?” One lad asked. “Where are you from?” Gill asked. This marks the first time in the history our our two nations, that a citizen of one has been welcomed to the other by a gigantic pair of cardboard underpants. At least as far as I know. 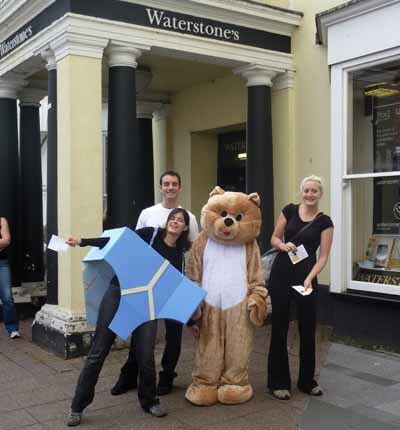 As the day drew to a close and our dancing bear had hugged her way into heat-stroke, Gill (in pants) tried to flyer a flyerer – only to find out the man was advertising The Path To Heaven. In fact he had a large placard with a flow diagram, neatly depicting which sins pointed you towards Purgatory and Hell (and in which order), and which acts of redemption allowed you to ascend to the clouds. It looked so… definite. He didn’t even offer me a flyer. I could tell from his expression that there is no place in heaven for people like us. So. What did I learn? 1) NO-ONE can resist ANYTHING when it’s handed to them by a walking pair of underpants. 2) Children love bears. Especially smiling ones. This works well, as while they are hugging, poking and otherwise molesting said bear, I can chat to the parents about my book. HOWEVER, it does make a lot of people think it is a children’s book. Perhaps I should consider writing a children’s book. Or renting a werewolf. 3) Promoting from behind a keyboard isn’t nearly as fun as getting out there in the real world. Especially if you’re a complete lunatic. I can’t imagine we made many sales from our activities, but we sent some photos and an article to the local paper. They’re bound to print something – literally nothing else happened here last week. 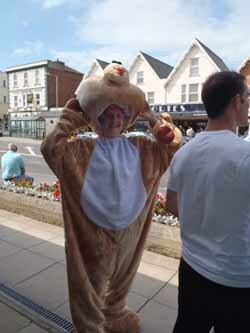 4) Hot day + hot bear costume = one sweaty fiancé. The Giant Underpants were far better ventilated. That is not a sentence I get to use very often. So. Done anything crazy lately? Ahh what a weekend, I’ve never been so wholly ridiculed, loved, cursed, steadfastly ignored and photographed by strangers in my life! It amuses me to think that somewhere a 65-year old Scouser is showing his grandkids holiday snaps from Somerset which include his eager posing with a bear and some pants. Also, when we got on the train home, the Guard said, “Um, you’re gonna have to take your pants off…” That’s something I hope never to hear again. Alas, hang around with me and it’s always a possibility. I find it hard to keep my pants on at the best of times – or would do, if I wore any. Ah, makes you wonder, eh? About the nature of life, the universe, the space-time continuum… and how different my life would be, if only I wore pants.